Hey, everyone! Okay, so first, can we talk about this top for just a second?!? 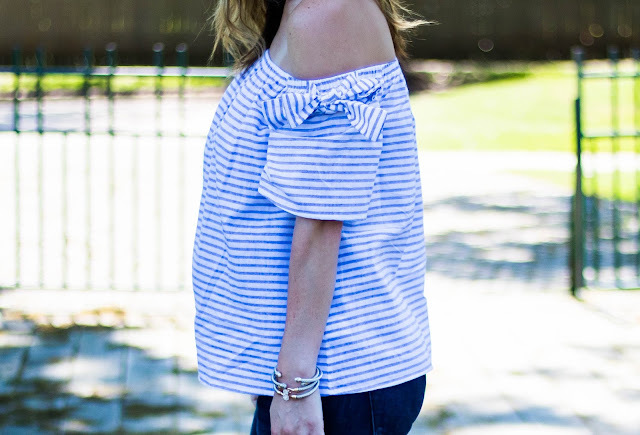 I LOVE the blue and white stripes, but the bows on the sleeves instantly sold me! Not to mention, it's non-maternity AND still covers my 30-week bump! I ordered my regular size in this shirt (small) mainly because my intention was to wear it after the baby is here but to my surprise, it actually still covered my bump completely! I know I won't be able to wear it my entire pregnancy, but for $35, I HAD to get it before it sold out! I love it so much and can't wait to wear it with shorts too! And if you don't have these wedges yet.....GIRRRRRLLLL! Get them! They are THE most comfortable shoes I have ever worn! I also have them in this color and style. 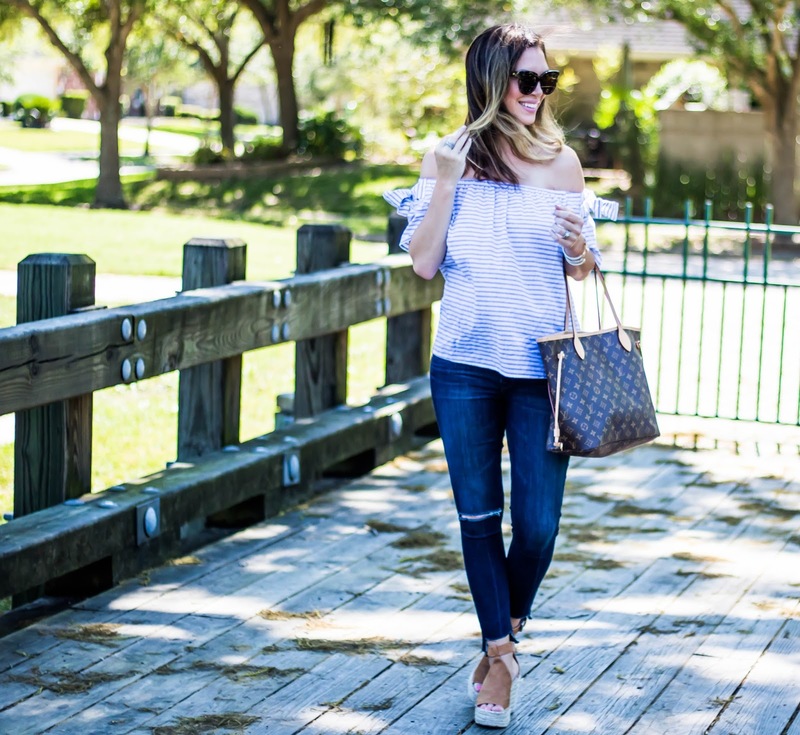 These jeans are maternity and I purchased them during black Friday, and got them at a HUGE discount! I'm definitely not one to splurge on maternity clothes, but I literally got them over 50% off! They do have a non-maternity version and don't get me wrong...I LOVE these jeans...but definitely wouldn't have paid full price for a pair I'm going to wear for a short period of time. Just my opinion on that. On another note....I spent some time last week completely redesigning my blog! I liked my old design, but it just didn't feel like..me...you know! This design, I'm completely in love with! I purchase the template here and let me tell you, I HIGHLY HIGHLY HIGHLY recommend her if you are looking to redesign your blog! The instructions she includes are so incredibly easy to follow, and I was able to upload everything myself. She also offers the option to upload everything for you for free if you don't want to tackle it yourself. I hope you all had a great Mother's Day Weekend! Being a mom has been such an incredible blessing. It's definitely not easy, but it's the most rewarding and amazing gift ever. I can't imagine my life before Londyn, and I can't wait to welcome her baby sister in a few short weeks! EEEEK!